Maximizing Progress: Canals ~ Early Disruptive & -ted Infrastructure! Canals ~ Early Disruptive & -ted Infrastructure! "When you take a look at the history of the Middlesex Canal, built from 1794 to 1802, you’ll find a surprising similarity between the issues facing technology investors today, with those over 200 years ago. 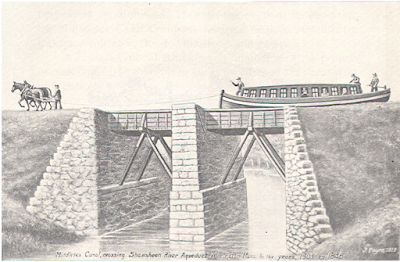 [...] The technology of moving goods at great scale and at low cost started with the Middlesex Canal. Then the railroads took over. Now containerization [...] Like all technology change, those in control of the current technology fight hard to hold on [...] But the march of technology is relentless when new approaches cut costs and increase speed." Be especially sure as you read Bill's story to check out his MapJunction tool to visualize the historic pathway overlaid over contemporary photo-map!